In terms of blessings, the ability to go enjoy a grape ice-cream slush from Sonic may seem like a small thing. But for the Trent family, their 16-year-old son Grant’s ability to drive to the fast-food restaurant and enjoy a favorite treat with friends means the world. 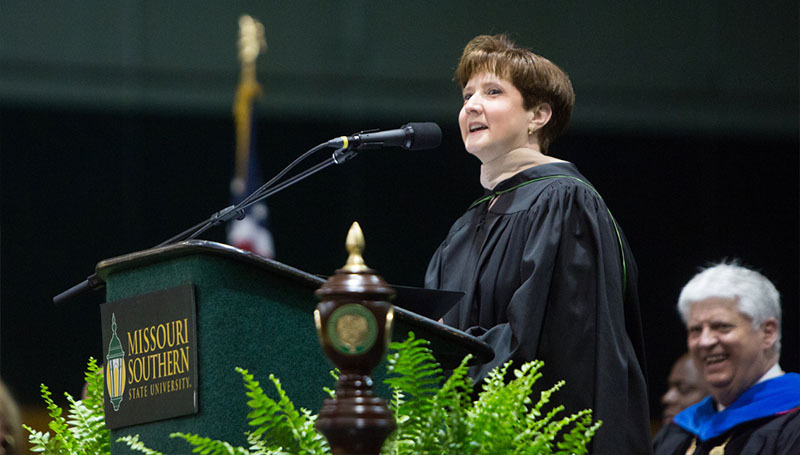 Tammy Trent, senior vice president and chief accounting officer for Leggett & Platt, served as the keynote speaker for the 2018 Spring Commencement ceremonies on May 12 at Missouri Southern. For the students and families present, the theme of what it takes to achieve a goal was hit home throughout the program. In Trent’s speech, she highlighted how her family has worked to overcome adversity during the last nine months. “I would agree that I had faced little true adversity in life until nine months ago at 9 a.m. on Sunday morning, Aug. 13,” she said. “We received a call from a friend at the Carthage Fire Department telling us that our 16-year-old son was involved in a single-car accident. She spoke of his multiple injuries – including to his spinal cord – surgeries, and the months spent at a rehab facility in Colorado. Paralyzed from the mid-chest down, he will likely be in a wheelchair long-term. But he’s returned to school as junior in Carthage, drives a truck with hand controls and was recently inducted into the National Honor Society. Grant, who was present for the afternoon commencement ceremony, sat next to his father in the Leggett & Platt Athletic Center, letting the warm applause from the hundreds of graduates and their families wash over him as his mother detailed his recovery efforts. It was an important message for the 727 Missouri Southern graduates who received degrees and prepared to take the next step on life’s journey. While the Trents’ story was a personal one, each student walking across the stage has no doubt faced their own adversity during their years as a student. During his commencement address, MSSU President Dr. Alan Marble took a moment to remind them of this fact. Fittingly, he also asked parents, spouses and children of graduates to stand for special recognition for the support they offered their loved ones along the way. Dr. Paula Carson, provost and vice president for academic affairs, paid special recognition to students who were graduating with honors. She made it a point to also single out those students who came to Missouri Southern from 10 different countries. Before departing, those assembled were led in a performance of the school’s “Alma Mater.” Forrest Bunter, a music major from Neosho, sang during the morning ceremony, while Adam Hajeh, a music education major from Lee’s Summit, took the stage in the afternoon.